Find artworks, auction results, sale prices and pictures of Ivan Vasilievich Klyun at auctions worldwide. 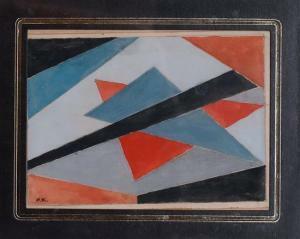 Sale 165 Lot 64 Ivan Vasilievich Kliun 1873-1943 (Russian) Composition gouache on paper h:13 w:15 cm. initialled lower left Provenance: Sale: Michel Homme, October 9, 2005, lot 257. The Estate of the Late David Garber, London, acquired at the above sale. And through inheritance in the family. Other Notes: Location: Israel. For estimated delivery time please contact us. 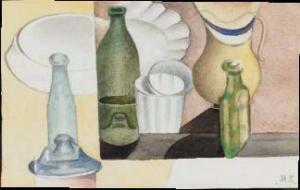 which ushered in a new style of art. He was director of the Central Exhibitions Bureau for the Fine Art Department of Narkompros (The People's Commissariat for Enlightenment). During that time as well, he taught at the Moscow Free Art Studios and the Vkhutemas Higher Artistic and Technical Workshops. In the 1920s, he was one of the organizers of the Museum of Painting Culture, which was created as a center for modern art. Board is buckling and horizontal crack to board entire width of painting. signed with cyrillic initials lower right. Unframed. Provenance: Ex. Coll. George Costakis, Moscow; Gifted to Mr. Marshall A. Crowe and the Late Mrs. Doris Crowe, Ontario, Canada in 1982 on the occasion of Costakis' visit to the Crowe farm near Ottawa in July and August of 1982, to attend his important exhibition being held at The National Gallery of Canada, Ottawa. Note: Peter Roberts writes:\“Kliun was one of the few members of the group whom Costakis knew personally... The survival of Kliun's work, or part of it, is one of Costakis' most extraordinary achievements.\” Literature: Peter Roberts, George Costakis,A Russian Life in Art, pp.68-69 4.6\” x 7.3\” — 11.7 x 18.5 cm. Serafima Kliun, the artist's daughter. George Costakis, Moscow and Athens, by whom acquired from the abovecirca 1968; his sale, Sotheby's, London, 4 April 1990, lot501. A. Rudenstine (ed. ), S. F. Starr & G. Costakis, The GeorgeCostakis Collection, Russian Avant-Garde Art, London, 1981, no. 132(illustrated p. 144). New York, The Solomon R. Guggenheim Museum, Art of the AvantGarde in Russia: Selections from the George Costakis Collection,1981, no. 23i (illustrated p. 63). 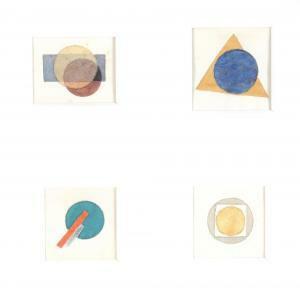 This exhibition later travelledto Stockolm, Moderna Museet; London, The Royal Academy of Arts; andMunich, Lenbachhaus. 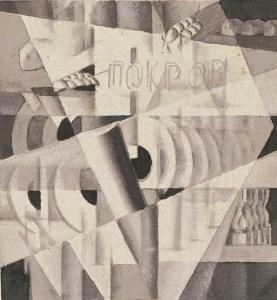 Hanover, Kestner Gesellschaft, Russische Avantgarde aus derSammlung Costakis, no. 165, 1984. Helsinki, Kapungin Taidemuseo and Helsingfors Stads Konstmuseum,Russian Avat Garde from the George Costakis Collection, no. 163,1984. Dublin, The Royal Hospital, Kilmainham, ROSC '88, Selections fromthe George Costakis Collection of the Avant-Garde in Russia, August- October 1988, no. 15. Montreal, The Montreal Museum of Fine Arts, The Russian and SovietAvant-Garde: Works from the Collection of George Costakis, March -May 1989, no. 56 (illustrated). This work is a preparatory study for one of Kliun's mostinteresting Cubo-Futurist projects - the sculptural reliefLandscape Rushing By, executed in 1914-15, formerly in the CostakisCollection, donated by Costakis to the Tetriakov Gallery,Moscow. The inscription 'Pokrov' (Protection) could have a specialsignificance as a reference to 'The Pokrov', an image of the Virginstanding beneath a red veil (Pokrov) held by two angels, in earlyRussian icons. 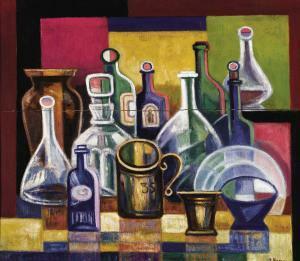 Like many Avant-Garde artists, Kliun was influencedand inspired by the primitive quality of early icons.